The impetus and passion behind Caddy For A Cure is a disease called Fanconi anemia. Accordingly, the Fanconi Anemia Research Fund receives a portion of funds received by the Caddy For A Cure program. 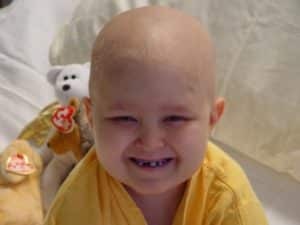 When Christian Collins was born on August 25th, 1993, it awakened us to a world that we did not know existed with this lethal and devastating disease. One could say that Caddy For A Cure was conceived of sorts the day we met Fanconi. It has since become our life’s mission to make a difference in this rare disease that so heavily impacts the families of those who are afflicted by it. Fanconi anemia (FA) is one of the inherited anemia’s that leads to bone marrow failure (aplastic anemia). It is a recessive disorder: if both parents carry a defect (mutation) in the same FA gene, each of their children has a 25% chance of inheriting the defective gene from both parents. When this happens, the child will have FA. FA occurs equally in males and females. It is found in all ethnic groups, but is a predominant disease in the Ashkenazi Jewish population. Though considered primarily a blood disease, it can affect all systems of the body. Many patients eventually develop acute myelogenous leukemia (AML) and at a very early age. FA patients are extremely likely to develop head and neck, gynecological, and/or gastrointestinal squamous cell carcinomas, again at a much earlier age than in squamous cell carcinoma patients in the general population. Patients who have had a successful bone marrow transplant and, thus, are cured of the blood problem associated with FA still must have regular examinations to watch for signs of cancer. We at Caddy For A Cure are deeply humbled to be torch bearers in the world of golf for Fanconi anemia. While rare indeed, we recognize that it is devastating for the families who live with it. We ask for your help and support in our efforts to eliminate this disease.